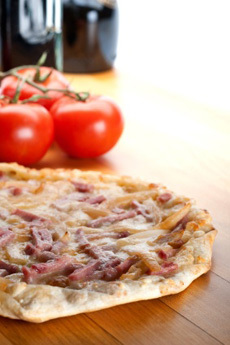 Slather caramelized onions on a pizza crust with bacon, ham or prosciutto. Photo by Image Media Group | IST. JOHNNY GNALL is a chef and food writer in San Francisco. CAPSULE REPORT: Caramelized onions are one of life’s luscious foods. Buying a jar will cost you a small fortune, but caramelized onions are very easy to make at home. In fact, you can give them as gifts. They’ll be much more appreciated than a bottle of wine. This is Page 2 of a three-page article. Click on the black links below to visit other pages. It’s easy if you know the technique. Be patient, refrain from stirring too often and trust yourself to react. If you can do this, you can caramelize with the best of them. Size is the name of the game. In order to achieve caramelization, you need most of the water to evaporate. This won’t happen very quickly if your pan is so small that your onion slices are all piled up on top of each other. With a pan that is too small, all you’ll end up doing is sweating your onions, which is a different process. Get as big a pan as you can and spread the onions out in one even layer. It’s all about surface area: The more onion slices that touch the hot pan, the quicker the process will go—as long as you’re allowing the steam to escape. Use a thick-bottomed pan. This will help distribute heat more evenly so that all of your onions will start to caramelize at about the same time. For the best results, use an oil with a high smoke point, like canola or grapeseed oil (see our chart of oil smoke points). Olive oil and butter smoke points are too low: You’ll get smoke before you get an ideal heat. We prefer monounsaturated canola oil to polyunsaturated grapeseed oil. The monounsaturated oils are heart-healthy and good for you. Polyunsaturated oils are only somewhat good for you. Here’s the scoop on healthy fats. In order to get the pan as hot as possible, start with your flame on high heat. Add enough oil to generously cover the pan surface. Oil and other fats are conductors, which means they help transfer heat. Without enough oil, it will be harder to get an even caramelization of your onions. And keep the bottle of oil handy; you’ll use it again later. 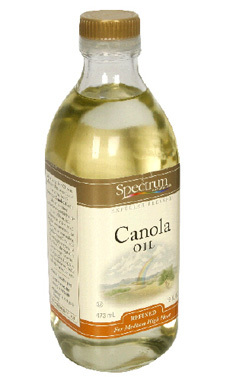 Canola is the best high smoke point oil that is also priced for everyday use. Photo courtesy Spectrum. After you add the oil, get it hot. First, test the pan for readiness by dropping a single slice or sliver of onion into the pan. If it starts sizzling instantly, the pan is ready. If not, just pull the onion out and wait a bit longer. Once you get the onions into the pan, spread them out in an even layer. Remember that the center of the pan is likely to be hotter than the edges, so pay more attention to the onions in the middle. They will probably start to caramelize first. DO NOT ADD SALT to your onions. Salt is hydroscopic, which means it helps to draw water out of onions and other vegetables. You want the heat to do all the work in getting rid of the water, through evaporation. Adding salt early on will often yield the same results as crowding your pan: sweating, not caramelizing. Hold off on salt until the end. If you like things sweet, add a teaspoon of brown sugar. Let the onions sit: This is the most important time in the caramelization process. The first 5 minutes are crucial to success. Alas, it is also hard to apply exact measurements for time and heat, due to the variables mentioned earlier. However, if you know what you’re looking for—and not looking for—your observations and reactions can help stay the course. The most important thing you can do here is NOT STIR the onions. Once you’ve spread your onions out evenly, it’s important to let them sit. Caramelization occurs first when the onions are in contact with the hot pan, and if you constantly stir, you’re keeping them from doing that (as well as releasing heat). So refrain from stirring! Watch your onions carefully. When you start to see brown edges on the majority of the onions, turn the heat down to medium and then, finally, give them a quick stir. The hardest part is over. Watch and react. From here on, all you have to do is pay attention. If you’re not pressed for time, you can keep the heat low and check them every 5-10 minutes or so. If you’re in more of a hurry, leave the heat on medium or medium-high and check every 2-3 minutes. Any time the pan or the onions start to look dry, feel free to add more oil. The onions will absorb some oil, and the rest will get cooked off. Add a couple of tablespoons of oil (just enough to coat the bottom of the pan) and give everything a quick stir. If you start to see black specks, give a quick stir and lower your heat slightly. You’ll notice that oil and stirring act sort of like fail-safes: Either one will temporarily delay the caramelization process if things start to go south, allowing you to adjust accordingly. Technically, any brownness is caramelization, but there can be varying degrees of it, especially with other vegetables. Endive, for example, can be browned just slightly. With onions, however, have the patience to wait for the real deal: fully brown, soft and sweet as sugar. The further you get in the process, the more you can stir. And once you’ve gotten to caramel perfection, don’t forget to season with salt and pepper. I also like to finish with a tablespoon of butter, as it helps to get all the bits of goodness off the pan and into the onions…because all the brown in your pan is sugar! You can also add a splash of balsamic vinegar. If you stick to these guidelines and pay attention to what you’re doing, you can get perfectly caramelized onions every time. The more comfortable you get, the more adventurous you can be with what you choose to caramelize. 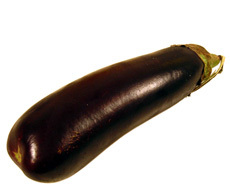 Wait 'til you taste caramelized eggplant. Make other delicious caramelized vegetables. Here are some of our favorites. Note that thicker vegetables (indicated with an asterisk) need to be blanched or parcooked first. Next, caramelize an eggplant. Photo courtesy PachD.com.